Pet Education: What Does Pain Look Like? "He's not in any pain; he just looks depressed"
"My dog is moving slowly during agility competition. What can I feed him to make him move faster"
"Hot wire fencing doesn't hurt. The dog just yelps when he she touches it." "Prong collars don't hurt. They simply apply even pressure." "Putting a slip leash high behind the ears is calming"
"Choke chains don't hurt. The sound of the metal tells the dog to stop pulling." "Shock collars don't hurt. It's like static electricity from walking on carpet." 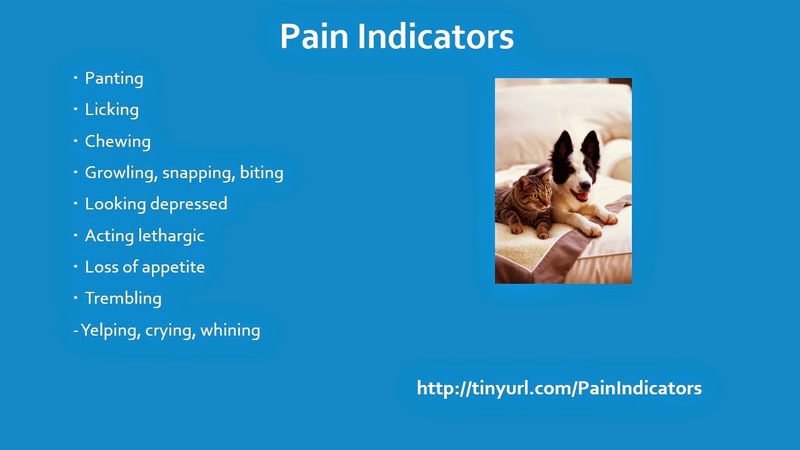 Looking depressed, moving slowly, refusing to move, yelping, whining, crying, etc... could all be indicators of pain. What looks like obedience or calm might be a dog who is afraid to do anything because of pain or fear of pain. Be aware that a lot of "tools" and "equipment" that we use on dogs are specifically designed to cause pain and discomfort. Not only can the pain be immediate, but there can also be long term problems with the over use or improper use of certain types of equipment. Be aware that over exercise and/or improper or dangerous exercise can cause pain. Has your dog had any behavioral issues that turned out to be pain related?